With some very smart people, I work on problems in data visualization applied to cancer research and genome analysis. Previously I was involved in fingerprint mapping, system administration, computer security, fashion photography, medical imaging and LHC particle physics. My work is guided by a need to rationalize, make things pretty, combine science with art, mince words, find good questions and help make connections between ideas. All while exercising snark. These color resources are a side project and provided absolutely free to use with no restrictions. If you find them useful, your donation would be a way to say thanks. The colorconvert (read documentation) converts colors between color spaces, white points and RGB working spaces. colorconvert is very useful for analyzing and transforming color coordinates. The output can be easily parsed by downstream scripts or imported into a spreadsheet. You can read colors from a file. For example, you can use colorconvert to get the RGB and XYZ color coordinates of all white points at each color temperature in the range 4,000–25,000 K.
The tool has support for the following color spaces: RGB XYZ xyY Lab LCHab Luv LCHuv HSL HSV CMY CMYK YCbCr YPbPr YUV YIQ LMS, RGB working spaces: 601, 709, Adobe, Adobe RGB (1998), Apple, Apple RGB, BestRGB, Beta RGB, BruceRGB, CIE, CIE ITU, CIE Rec 601, CIE Rec 709, ColorMatch, DonRGB4, ECI, Ekta Space PS5, NTSC, PAL, PAL/SECAM, ProPhoto, SMPTE, SMPTE-C, WideGamut, sRGB white points: A B C D50 D55 D65 D75 D93 E F11 F2 F7 4000K-25000K. The Gretag Macbeth color checker represented in sRGB D65 colors. 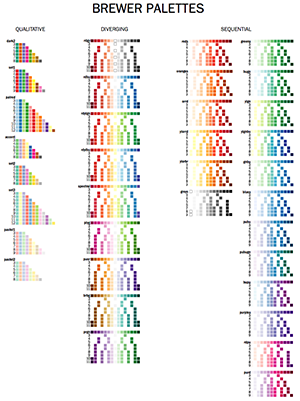 Colors from RGB coordinates of the Macbeth colorchecker by D. Pascale (download colors). If you want to find specific colors in an image or snap colors to a set of reference colors then my colorsnap application is for you (read documentation). This application is useful if you want to figure out what fraction of an image is occupied by a specific color (or color range). The color clustering provided by the colorsummarizer is not useful in this case since the clustering does not key off specific colors. colorsnap will also report the average color of all snapped colors for each reference color and the `\Delta E` of the reference and average. No shape or position analysis is performed whatsoever. Each pixel is snapped independently. The application is written in Perl and runs natively on Linux. I've also created a compiled binary for Windows—no need to install Perl. It generates plain-text reports about color proportions, making it perfect for scripting and reports and analyzing the colors in a large number of images. As usual, for windows replace / in filepaths with \. 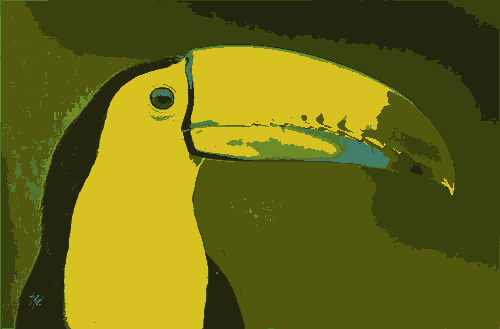 For example, the tucan image below was snapped to the 24 Gretag Macbeth colorchecker colors—each color in the original image was matched to the closest color in the colorchecker. ▲ Image snapped to nearest Gretag Macbeth colorchecker color. When snapping to reference colors you can impose a maximum color difference, as measured by `\Delta E`. The application also generates a plain-text report of the color distribution—great for scripting and reports. 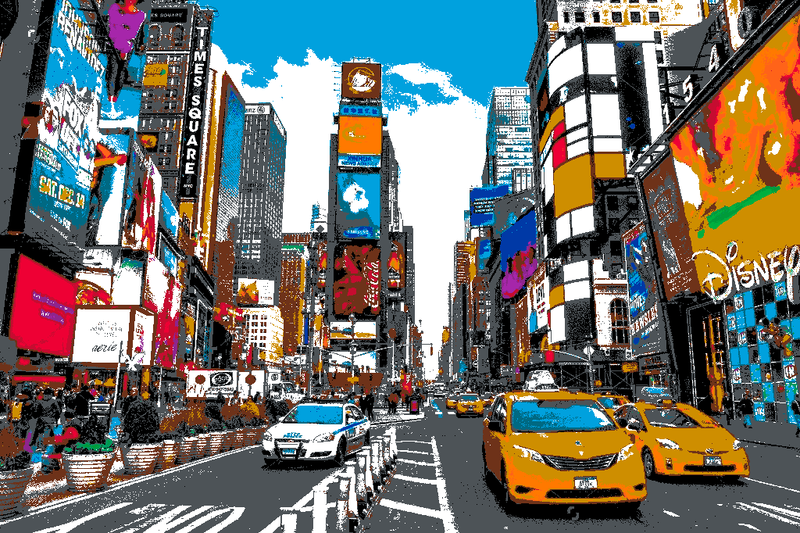 You can uses this application for quick and easy image color analysis. 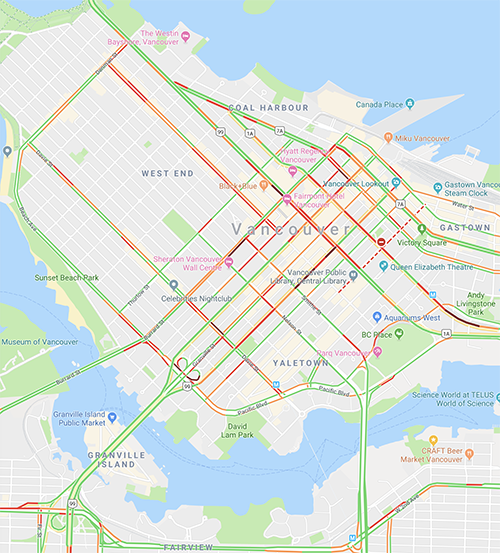 For example, by using the Google maps traffic density colors, you can snap the colors in a Google map to these colors (disregarding all others) to get a sense of the fraction of streets that are busy. 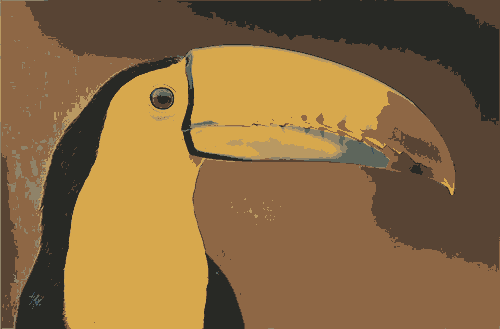 You can use colorsnap to convert artwork to a different palette. 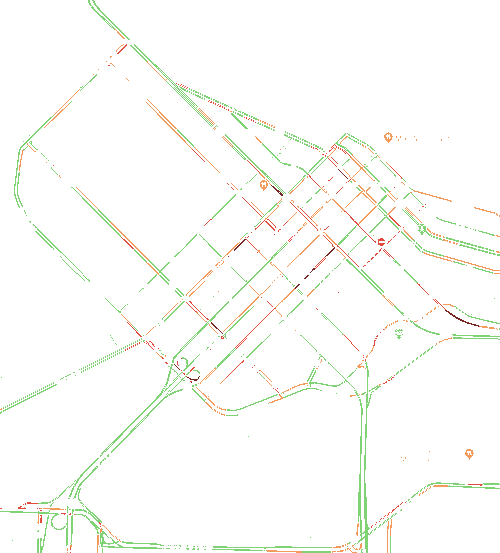 For example, below are the colors of the subway lines in New York City, Paris and London. Colors used by the Paris metro lines. Colors used by the London underground lines. Colors used by the Tokyo subway lines. The Granger rainbow gives a concrete example of how snapping works. 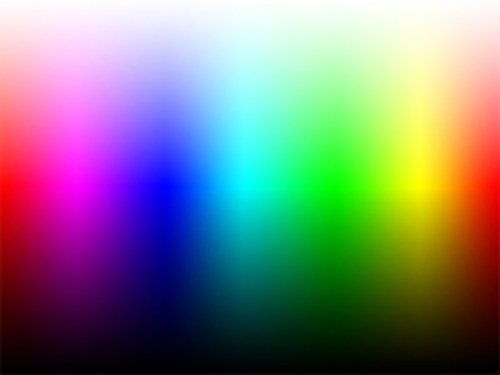 This rainbow is a color calibration image and contains all the RGB colors—here resized as a small image so strictly not all colors are present. One way of deriving the reference colors is to use colorsummarizer (see below) to cluster colors in oine image and then using the average cluster color as the input for colorsnap for a different image. 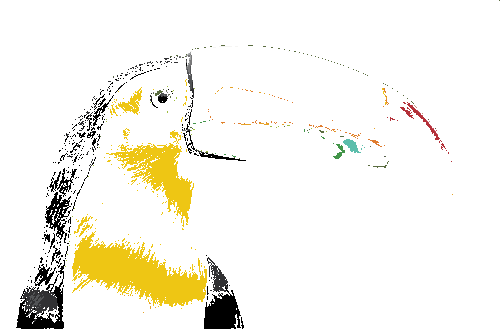 Let's try this with the tucan image with Munch's Scream as the reference. `k=8` means clusters for Munch's Scream (download colors). `k=32` means clusters for Munch's Scream (download colors). Above are the swatches for each of the `k=8` and `k=32` clusters of The Scream as analyzed by my colorsummarizer image clustering tool. 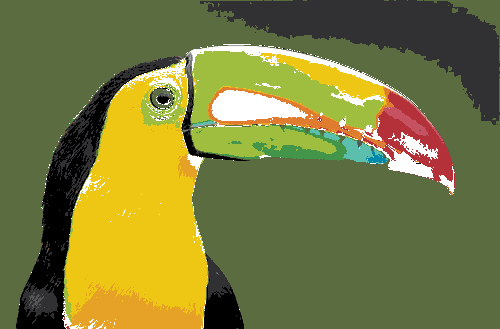 Below are the colorsnap results for the tucan image using `k=8` cluster colors. 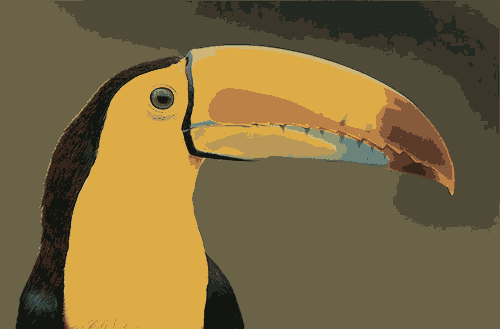 The color summarizer generates statistical color summaries of images. Whereas colorsnap (see above) calculates how close the colors in an image match a set of reference colors, colorsummarizer finds `k` such reference colors for which the difference compared to the image colors is minimum. 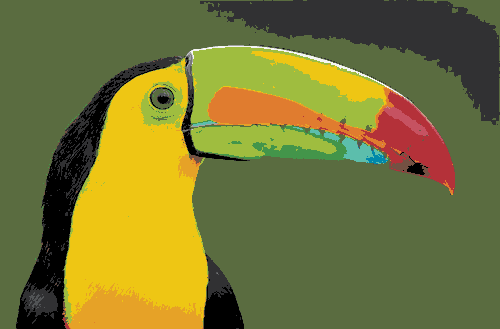 It reports average RGB, HSV, LAB and LCH color components as well as histograms and individual pixel values for these color spaces. Comes with useful web API for all your automation needs. Yes! I support LCH, which is extremely useful in generating color ramps and, in general, talking about perceptual aspects of color that are intuitive. 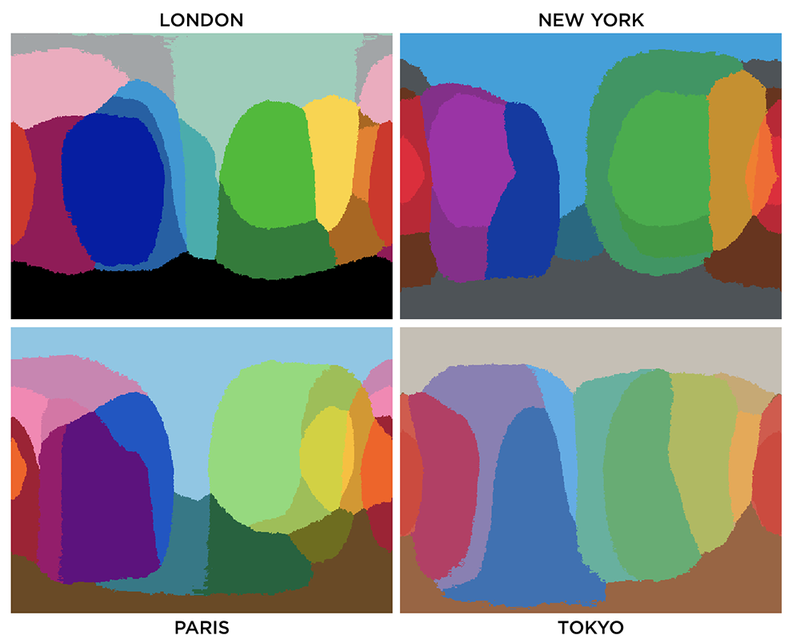 ▲ My color summarizer reports the representative colors in an image by grouping colors into clusters of similar colors and reporting the average color in each cluster. This is useful in image identification and comparison. 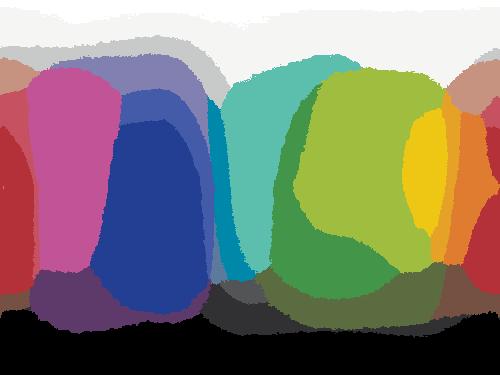 The color summarizer also identifies representative colors in the image by using k-means clustering to group colors into clusters. The centers of each cluster are also reported by name, using my large database of named colors. 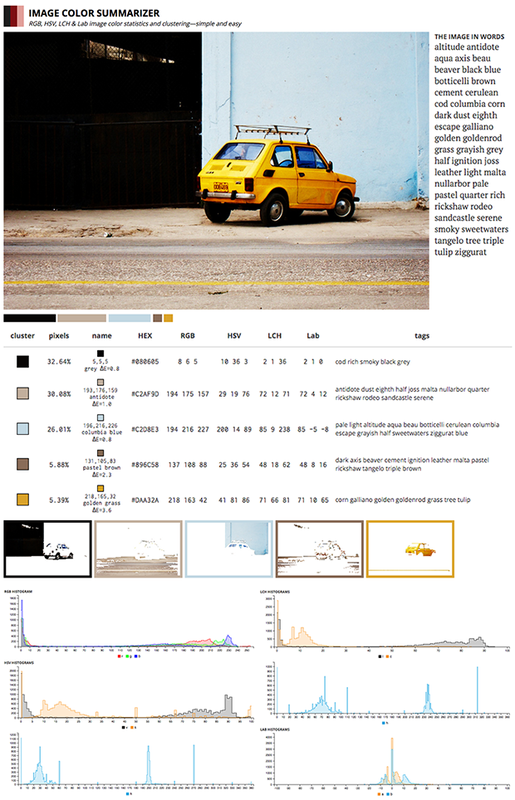 Below is an example of a detailed color report of an image—an adorable Fiat 126p I found while it was screaming out its color against the fading background of Havana. ▲ My color summarizer generates statistical color summaries of images, including a poetic list of words used to describe the colors. ▲ All the Brewer palettes at a glance. The Brewer color palettes are an excellent source for perceptually uniform color palettes. I provide Adobe Swatches for all colors in the Brewer Palettes. I also provide a short talk to help you understand why these palettes are important. Color blindness is a thing. You should worry about it when you're designing and especially when you're encoding information. ▲ Sets of representative hues and tones that are indistinguishable to individuals with different kinds of color blindness. The rectangle below the each color pair shows how the colors appear to someone with color blindness. I provide some background on color blindness and give options for choosing 7-, 12- and 15-color palettes that are colorblind safe. ▲ (left) Colors grouped by equivalence of perception in deuteranopes. Each of the two hues is represented in six different brightness and chroma combinations. (right) One of the subsets of colors on the left that are reasonably distinct in both deuteranopia and protanopia. To tritanopes, three of the pairs are difficult to distinguish. Probably the world's largest list of named colors. With more than 8,300 colors, even a mantis shrimp would be impressed. You can finally imagine a color you can't even imagine and name it! ▲ Use my list of named colors to name the colors in the Google logo: dodger blue, cinnabar, amber and medium emerland green. The color name list is hooked into the color summarizer's clustering. 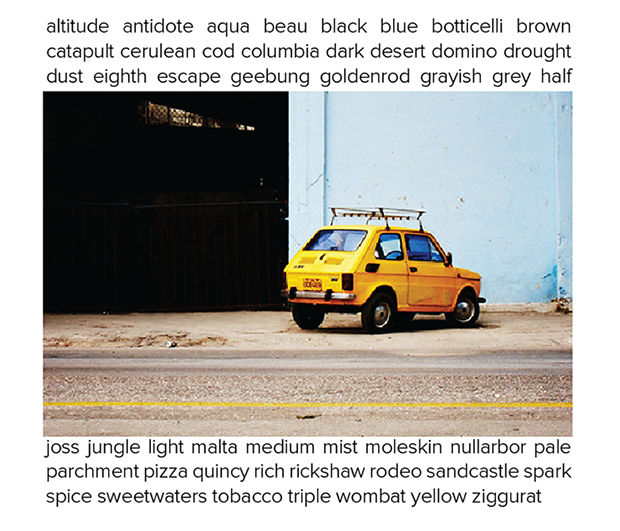 You can get a list of words, derived from the color names, that describes an image. 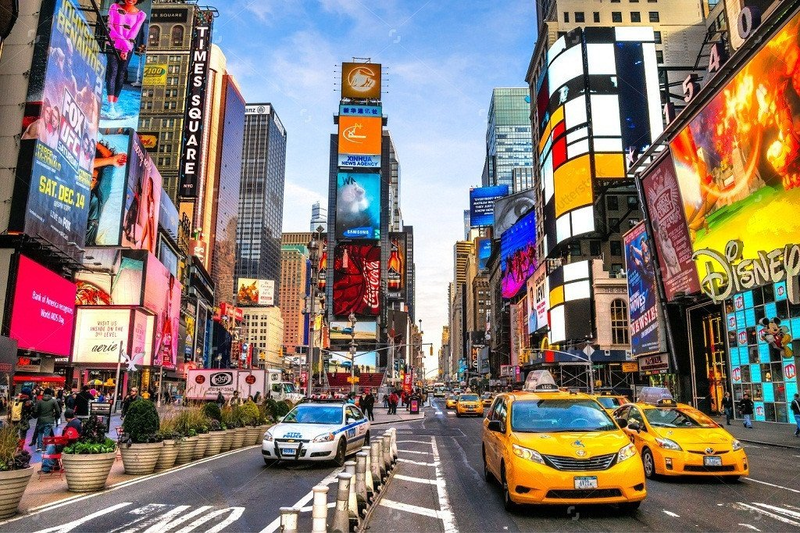 ▲ The color summarizer returns words that qualitatively describe the image. A visual survey of the color proportions in flags of 256 countries. 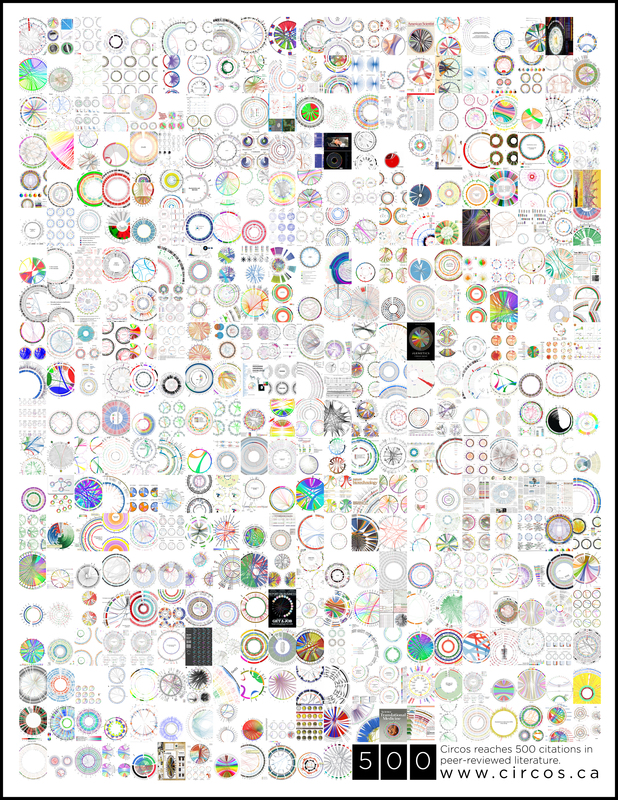 ▲ (right) 256 country flags as concentric circles showing the proportions of each color in the flag. (left) Unique flags sorted by similarity. Flags are depicted by concentric rings whose thickness is a function of the amount of that color in the flag. I make the flag color catalog available, as well as similarity scores based on color proportions for each flag pair, so you can run your own analysis.